If you’re just dropping in, I am sharing bits of wisdom that I’ve learned from our time in the military–stuff that I would’ve loved to have learned going in!–every Monday. For previous Military Monday posts, you can check out the Military page of SeeMoxRun. This week I thought we’d cover the topic of Rank. Now there are a couple cases to be made for taking the time to learn your spouse’s rank and the rank structure of the branch of service that they are in. It’s a way of showing your spouse support. 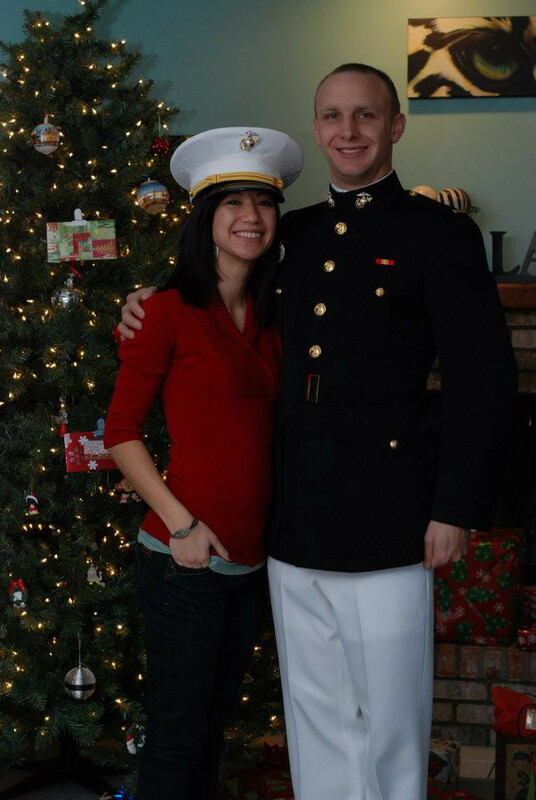 Your service member worked very hard to achieve the rank represented on his or her uniform. The least we can do as spouses is know that rank and understand how it works in the ranking system. It puts you in the know. When your spouse starts talking military lingo, (a whole new language), it’s nice to be able to keep up once in awhile. Rank is a whole new social system in the military world, complete with new taboos and politically correct ways of interacting. As civilians, we’re exempt from those rules, but it’s beneficial to understand them, especially when it comes to understanding how your spouse is relating to other ranking service members. So here’s a basic crash-course on rank. They differ by branch of service, but the general low-down is more or less the same. Any specific examples listed in this post will be specific to the US Marine Corps. 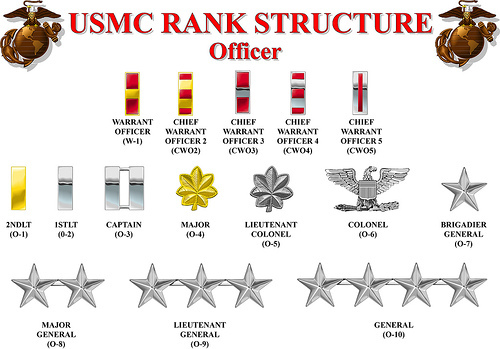 So the rank system is divided into two categories: the Enlisted rank and the Officer rank. One of the requirements for obtaining an Officer rank is a 4-year college degree. So, for example, if your spouse enlisted right after high school, they started as an E-1, or Private. Study up, there’ll be a quiz later. … Just kidding. Maybe. With time in the service and qualifying FIT reps (progress reports), they move up in rank. 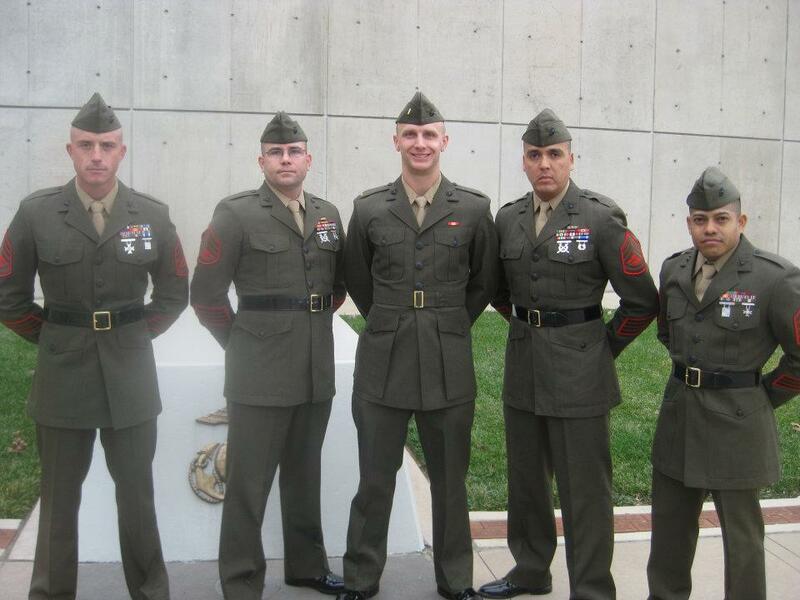 Jason with his drill instructors. 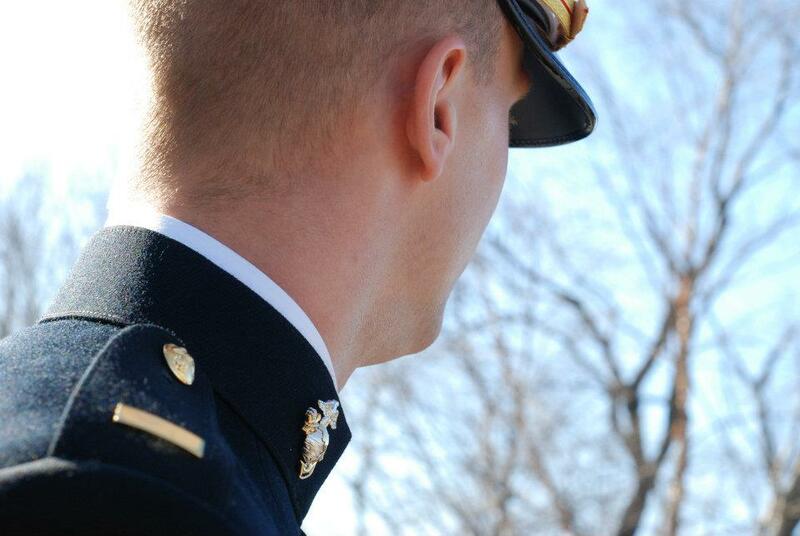 Rank insignia is found on the shoulders, covers, and collars–not the breast. (USMC). 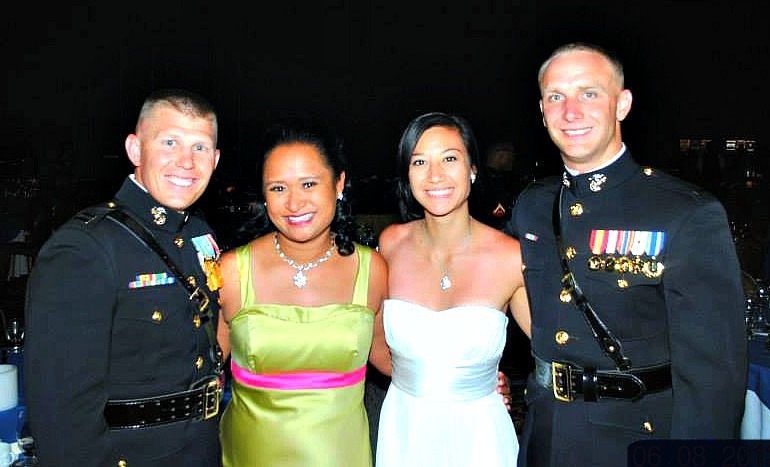 Alternatively, if your spouse joined the service after graduating college, participated in a University’s ROTC program, or after having obtained a bachelor’s degree while serving as an Enlisted service member, then they would have entered the Marine Corps (or other branch) after completing OCS, (the Officer Candidates Course). Officers are commissioned. Again, with time and qualifying FIT reps, a service member moves up the Officer rank. Other differences include MOS options and training, but we’ll get into that later. 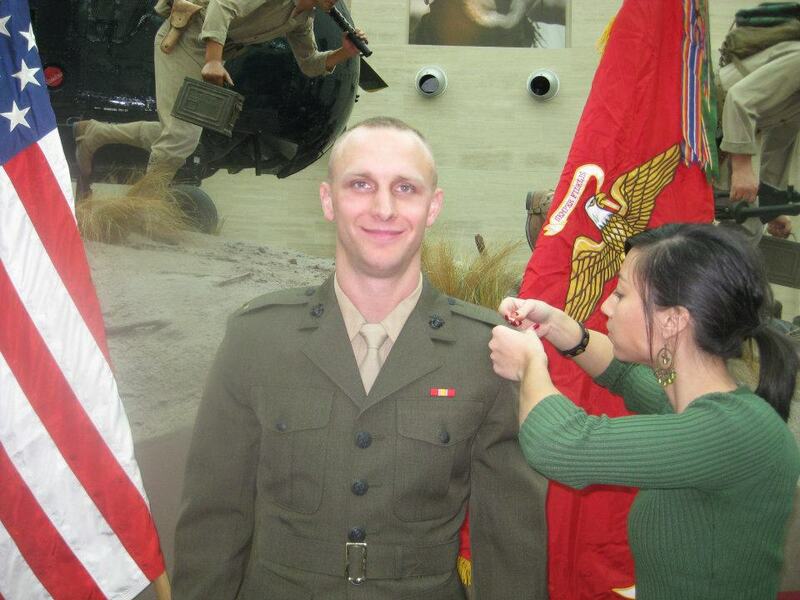 Pinning Jason’s brand-new rank on at his Commissioning Ceremony in Quantico, Virginia. 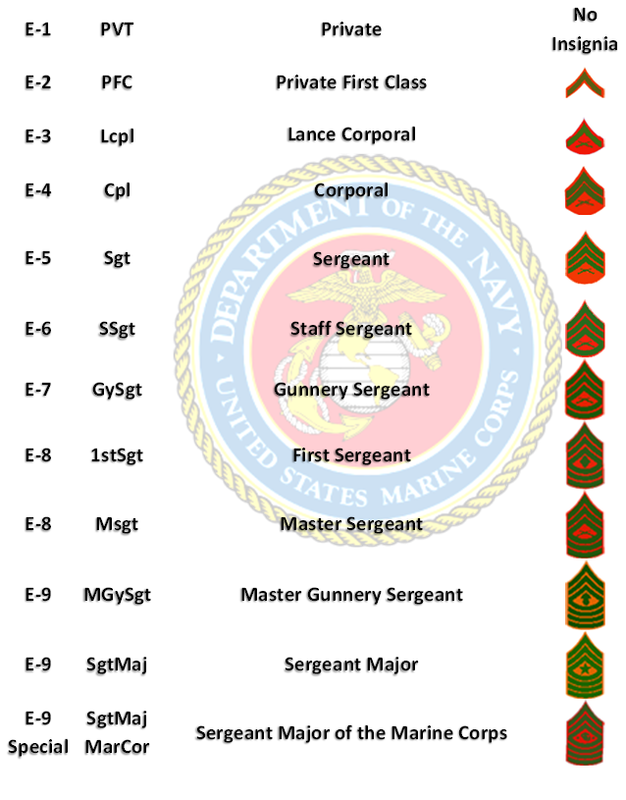 A note about NCO’s, or Non-Commissioned Officers: these are Enlisted Marines (E-4 thru E-9) who lead Enlisted Marines but are not commissioned, as in Officers that have completed Officer Candidate School, (OCS). Now, a book could probably be written about this–(actually, there have been books written about this)–but I’m just going to note a couple things that I think a spouse should know. All Enlisted service members address Officers as “Sir” or “Ma’am” and salute. This only applies while in uniform, when you can discern a member’s rank by their insignia, (another reason to study the tables above). Similarly, all Officers salute other higher ranking Officers while in uniform. As civilians, it can be a little awkward at times when your spouse suddenly stiffens up to address a higher-ranking service member. I have learned to smile politely and show similar respect in how I talk and interact with them. You want to represent your service member well. Also, a good tip: when hanging on your spouse’s arm, be sure that it is the left one. This frees up his or her right arm to salute when necessary. Wrong side. We were newbies. Having a ranking system is a very important aspect of the military. It allows for organization, respect, structured leadership, and achievability within the Corps. However, and very unfortunately, it also leads to susceptibility to, well, snobbiness. 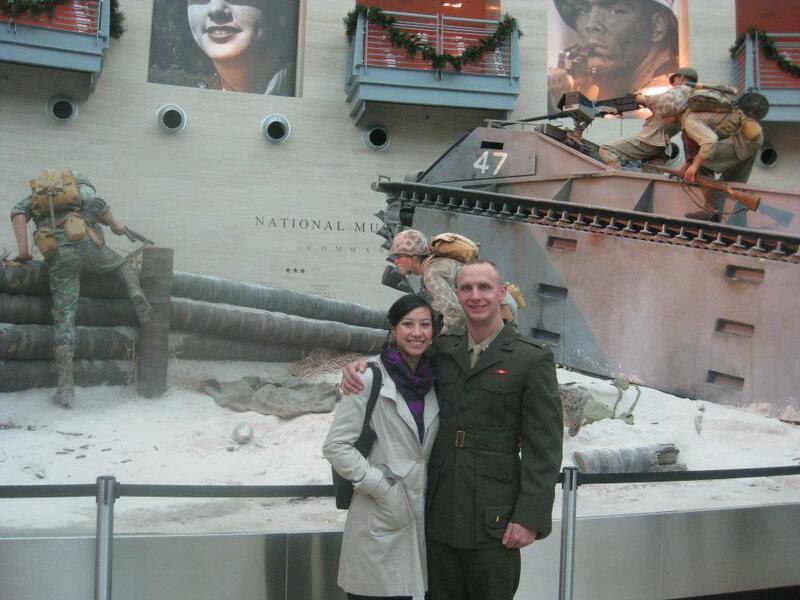 As a new Officer’s wife, it had shocked me to hear some of the experiences that Enlisted spouses had of Officers’ wives looking down their noses at them. Ugh! As I see it, every person, regardless of their rank or their spouse’s rank, is worthy of respect. If you are a military spouse, please don’t fall into the trap mindset that rank carries into the civilian world. 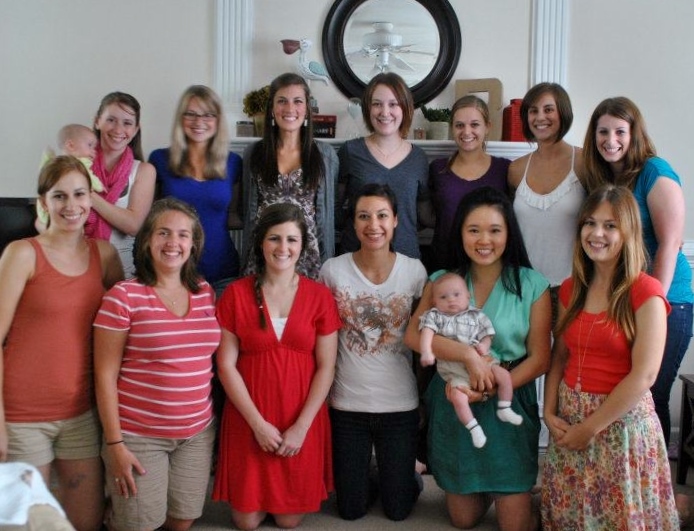 To be closed-minded about the spouses you hang out with based off of rank is to most likely miss out on a great friendship. And it’s just plain snobby. So! There you have it, folks. Rank in a nutshell. Feel free to give me a shout-out should you have any questions or additional experiences to share.